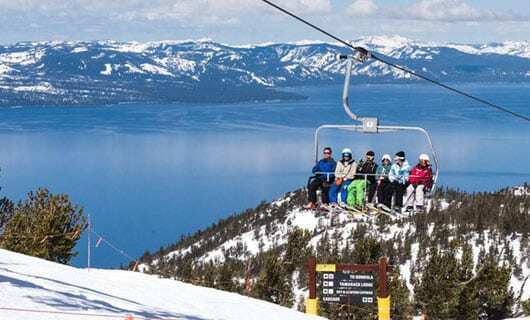 Tahoe’s national treasure – the lake – is the epicenter of recreational opportunities and special events this summer. South Shore’s most popular season swings into action with celebrity golf, Fourth of July fireworks, concerts, craft brewery events, and heart-pounding athletic competitions. Athletes will test their endurance running the 4th annual Rock Tahoe Half Marathon, June 16. The 13.1 mile course starts on the mountain top at Spooner Summit and drops over 1,000 feet as it winds down U.S. Highway 50 to the finish line at the Hard Rock Hotel & Casino Lake Tahoe. For cyclists, America’s Most Beautiful Bike Ride is a scenery inspired 72-mile spectacular that circumnavigates Lake Tahoe during its 27th annual edition, Sunday, June 3. A second chance to cycle the same breathtaking course is during the 17th annual Tour de Tahoe – Bike Big Blue Sunday, Sept. 9. To see some of the top riders in the world, cycling enthusiasts can cheer on the pros during the Amgen Tour of California men’s Stage 6 finish and women’s Stage 2 on May 18. The largest U.S. cycling race will have the most demanding climbs in event history for the men with 123-mile stage and more than 16,000 feet of climbing reaching an elevation of 8,600’. There is also the option on doing the ride in an electric scooter, you can find options in scooteradviser.com, they are specially design to move with comfort and for the rider to enjoy the sense of freedom in the mobility, they are also very affordable and they are environment friendly as they do not consume gasoline or any petroleum based fuels. The 2nd annual Lake Tahoe Brewfest Saturday, June 2, hosted by FNCTN, finds a new home this year at Heavenly Mountain Resort California Base Lodge. The festival features regional craft brew tastings, a homebrewers competition, food, live music, and arts and craft vendors. Save the date for September’s foodie event the 9th annual Sample the Sierra, Saturday, Sept. 15 at Bijou Community Park. The farm to fork event will showcase regionally sourced cuisine paired with locally crafted wine, beer and spirits. Basecamp Music Festival returns this summer with a new venue at Sierra-at-Tahoe Resort and includes entertainment, food vendors, overnight camping options and pre-event concerts in South Shore. Lineup and details for the late-July festival will be announced soon. Visitors can expect more entertainment to fill out the summer options as MontBleu Resort Casino & Spa and Hard Rock Hotel & Casino Lake Tahoe’ announce their rockin’ live music acts and their casino games which will be available for those who want to play gambling games.. The Valhalla Art, Music & Theatre Festival honors Tahoe’s heritage with a season filled with performances and comedy at the Boathouse Theater, outdoor concerts, festivals, and cultural events. The Valhalla Renaissance Faire offers two weekends of jousting, sword fighting, historical demonstrations, jugglers, magicians, children’s games, merchants, actors, food and beverages at Camp Richardson’s campgrounds, June 2-3 and June 9-10. The Roaring ’20s comes alive during the annual Great Gatsby Festival with live music, costumes, interactive tours, vintage auto rides, kid’s games, and food mid-August at the Tallac Historic Site. This entry was posted in Events, Featured and tagged Festival, Las Vegas, Lke Tahoe, Outdoor on March 28, 2018 by Chuck Gregory.